Well, not perfect but well pleased with my first foray into wood work. 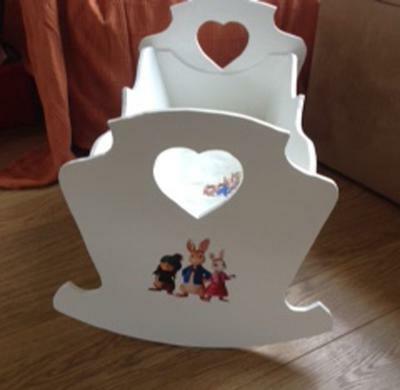 Thanks to your simple plans I have finished, what I think is a wonderful 2nd birthday pressie for my Grand daughter. My father made many toys for myself, brother and cousins etc. He carried on making for grand children and great grandchildren well into his seventies. He made me a large bungalow dolls house that fitted the top of a large chest of drawers. It was fabulous and I spent many hours playing with it. Unfortunately as it was robust it was very heavy. It was passed on to my cousin , who passed it on again! He made my daughter a little cooker that is now being played with by my grand daughter. It just needed a lick of paint. He also made a Welsh dresser which is still looking good and has been played with by my great nieces and nephew and of course my grand daughter. He made my daughter a dolls house and even made me choose between different finishes to get a snow cem finish on the outside. He mixed saw dust with paint, sand and paint and very fine gravel and paint . The finish chosen was sand and paint. This to was a favourite with my daughter and has / is a favourite with with visiting children. A little to old for my gran daughter as yet but certainly awaiting her joy. My brother had a fort and garage. The fort was passed onto his sons and with a bit of paint will soon be being played with by his grand children. My brother also had a black board easel which he couldn't play with until Boxing Day as " Santa was so busy that he worked right up to the sleigh ride and the paint was not dry !" Both of my children had special book ends which he designed and made, my daughter harsher teddy bear book ends pride of place in the nursery. It has been wonderful to play with these toys and then pass them on. So many memories and love are associated with this toys. You just can't beat wooden toys. Mum was the one to make curtains and bed linen, sofas and chairs for dolls houses and cots.